Special teams play is so often uncharted waters when it comes to NFL analysis in the media. Aside from NFL Network’s Rich Eisen’s ‘Punters Are People Too’ and Pat McAfee’s #ForTheBrand movements, special teams analysis very rarely bleeds into the mainstream, with the majority of it diluted into simple statistics like tackles, field goal percentages and net yards on punts. There is so much more that goes into every special teams play, and just like with any other play, all 11 players have exact assignments and their own roles to play. With the use of All-22 footage, we at PFF not only track who every player is on every special teams snap, but we also grade them. That has allowed us to get a better look at the best players in the third phase in the NFL, highlighting players who deliver key blocks, force returners away from their intended path and generally do the dirty work that allow big plays to happen. With that in mind, we have reached deep into the PFF database to discover who the top special teams player in the NFL for the 2017 season. 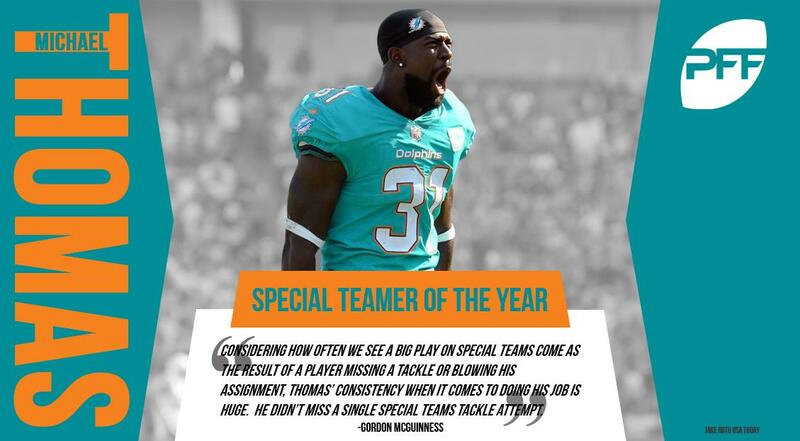 In an era where the term ‘special teams ace’ is thrown around to describe basically any player who plays on special teams, Michael Thomas of the Miami Dolphins is a player fitting of that description. Consistently one of the top players in the NFL on special teams since he first saw the field in 2013, the former undrafted free agent out of Stanford was a class above his peers in 2017. Before injury cut his season short after 14 weeks, Thomas had seen at least one snap at 10 different positions on the Dolphins kickoff coverage unit, and he was the Dolphins’ primary punt protector on punts. In these two roles, he racked up 10 special teams tackles, tied for fifth in the league after 14 weeks. More importantly, he didn’t miss a single special teams tackle attempt. Considering how often we see a big play on special teams come as the result of a player missing a tackle or blowing an assignment, Thomas’ consistency when it comes to doing his job was huge for the Dolphins when they kicked or punted the ball away to their opponents. When you look at his work on the other side of the spectrum, that’s where you really see Thomas stand out. Thomas was often found on the front line of the kickoff return unit, spent time on the defensive line of the punt return unit and even got 11 snaps at vice, where some of his best plays of the year came despite his comparatively small snap count. Arguably as important as the punt returner on those plays, the vice players are responsible for slowing down the gunners who line up as the wide men on the punt unit. With the gunners trying to get downfield to register a tackle, force a fair catch or maintain outside contain and force the returner towards the players charging downfield towards him, the vice can open up big holes down the sideline for the returner if they can properly slow down the gunner they are assigned to. Oftentimes, you’ll see teams line up with multiple vice on either side and that was the case on the play where Thomas joined teammate Bobby McCain to deliver one of the plays of the year. Coming against the Tennessee Titans, Thomas and McCain stonewalled the gunner inside his own 20-yard line. Plays on both sides of special teams define exactly why Thomas is the standard bearer for special teamers in the NFL right now. In delivering week in and week out, season in and season out, Michael Thomas has proven that he deserves to be recognized as our PFF Special Teams Player of the Year. It took Baker until the ninth week of the season to see significant time on the field on defense, but long before then, the second-round draft pick was delivering on special teams. He made many key blocks and finished the regular season with 13 total special teams tackles, tied for fourth-most in the NFL. Like I said though, special teams is about more than just tackles, and Baker was key to so much of what Arizona did on special teams, playing on the kickoff coverage, kickoff return, punt coverage, punt return and field goal/extra point defensive units. Ultimately, he fell just short of the season of our special teamer of the year, but Baker did deliver one of the most impressive blocks of the season on special teams, knocking Eric Weems of the Tennessee Titans to the ground after tracking him from the snap.